I continually blog and reach out to you because I want you to become aware of all the startup issues that might not have occurred to you yet. For instance, you might not be thinking about it now, but as soon as you start growing, you are going to start thinking about hiring your first few team members. This is a huge point of failure for most people, so there’s a big opportunity to make a positive impact in your life personally, and to achieve major business growth. But there’s a global reason as well. If we can help you safely through that transition, then you will become one of the 20 million entrepreneurs to add 5 or more jobs to the global economy in the next year or two – and job creation is the life blood of the economy. So by working with you, together we get to be a part of the economic solution for everybody’s future. We’ve designed Mind Money Meaning to simplify success, reduce the fear and frustration. To show you the path to grow your business 10x or more, then guide you along that path as rapidly as you can safely go – carrying as much of the weight for you as we can, like a sherpa in the Andes. We carry the weight for you by taking the burden of learning which assets are high leverage for you to develop and which aren’t relevant. In the last 15 years, we studied wildly successful businesses and carefully recorded the assets that they rely on for their success. 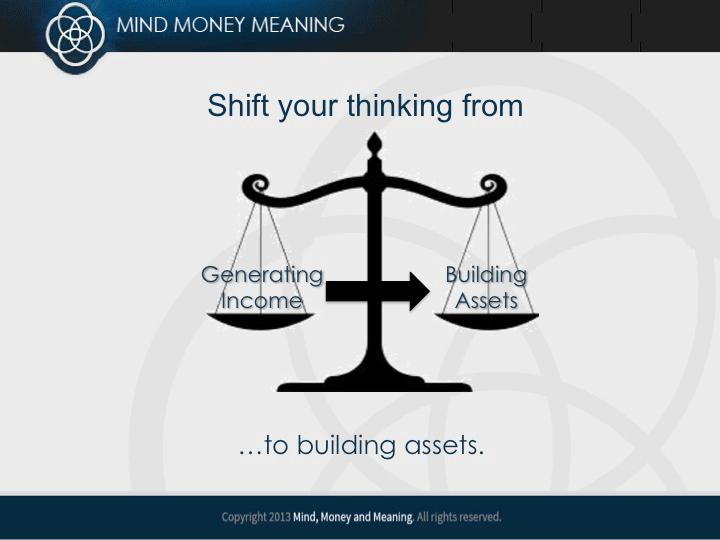 Then we built the Mind Money Meaning system to give these assets to you for you to use in your business. …That’s the key to overcoming growth obstacle #3. If you are trading your time for money and want to get paid more systematically and automatically for the work you do, then you must devote some time and energy to putting your business assets in place. Assets are tools, systems, processes, or relationships that can be relied on to produce a given result or part of a result in your business. The simplest assets include ‘a checking account’ and ‘a web hosting provider.’ Assets don’t grow your business on their own, just like any one part of an engine wouldn’t power your car on its own. But when you add them together in a well-designed system, suddenly they spring to life and start the process of paying you systematically and automatically. Devote at least three hours per week to developing assets in your business so you can make sure you are continually improving and getting farther and farther from trading your time for money. If you are suffering from Growth Obstacle #4 – not following up with your customers as quickly as you should – then you’ll need a different kind of asset to go along with a lead generating asset. Otherwise you will have dozens of qualified customers waiting for you to call them, rather than just a few. There’s nothing wrong with you – you have just gotten disconnected from one of your motivation drivers. It’s natural, when you’re facing the stress of trying to pay bills, scrambling to get new customers and keep the old ones happy, it’s easy to forget. But there’s another part of you that wants to make a difference. That wants to leave the world better than you found it. That wants to have a positive impact and really help other people. We’ll call this your “Impact Driver,” and it’s in charge of your calling, or what some would call your purpose. If you are having trouble getting motivated or calling back potential customers, it is your “Impact Driver” wanting you to pay more attention to making a positive difference. Perhaps deep down you aren’t as proud as you could be of the value you are actually delivering to your customers. Perhaps you want to make a bigger impact than you think you can by working with those customers. That’s why we’ve included assets in the Mind Money Meaning system like “Align with your deepest calling” and “Quantify the positive impact your business will make on the world around you.” When you follow these steps, your “Impact Driver” and your “Achievement Driver” get on the same page, and you find additional motivation available to do what’ needed. This is part of the “meaning” portion of the Mind Money Meaning system.